and giving it back to the world to enjoy. I’ve had a love for photography for as long as I can remember. I was in third grade when I got my very own camera for my birthday – it even had a zoom lens! I took it to the zoo on a class field trip and I still have those photos, I was so proud of them. I was sure that I wanted to be a National Geographic Photographer when I grew up. I started taking photography and dark room classes as soon as they were offered to me which was in the 8th grade. By the time my senior year came around I’d taken all of the photo classes they offered so I spent a couple hours a day in the darkroom on an independent study basis. I just loved it in there! After high school I started working at a high end portrait studio. I learned the basics of posing, lighting, color correction, and development – yes, film! But I never felt that being [trapped] in a studio setting really gave me the creative freedom that I yearned for. I took my career on a different path for a while and learned more about the magic that is Photoshop and its Creative Suite cousins. I have color corrected and prepared images and ads for publication & printing in scientific and medical journals for a few years. I’ve since moved on to website design and editing for the same company. In the mean time I’ve stuck with photography as a personal hobby and as a way to document my family and our adventures through life. Meanwhile “natural” portrait photography has sprung up and taken ahold of the market! My husband bought a dSLR camera for me (oh how I’ve missed that SLR style since my 35mm Minolta has since retired to the camera bag in our closet). I was asked by a friend to take pictures of her daughter. And my uncle asked me to take pictures of his band. Then another friend wanted some family pictures taken. And you know what? I realized how much I had missed all of this! I don’t just love taking pictures of my own family, I love capturing other family’s lives! And I love being able to meet families in locations that are special or meaningful to them. Or heck, its just nice to be able to work outside in beautiful settings and seeing people smile and cuddle with their kiddos. So thank you for taking an interest in my work and I hope we have the pleasure of working playing together soon! Contact me for more information and to set up an appointment to get your family and/ or kid’s pictures taken! 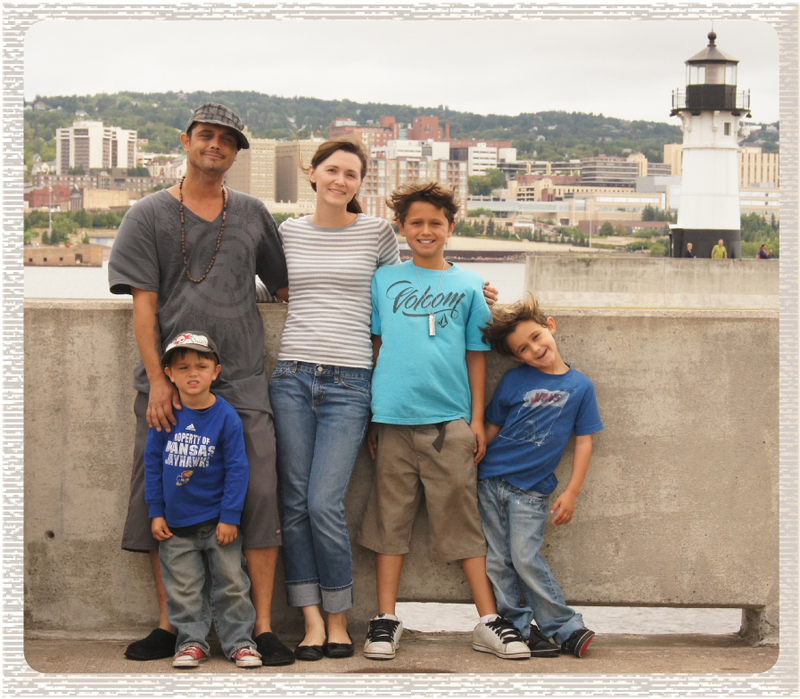 Here is my family while we are visiting a lighthouse at Lake Superior. I love this picture, not because its a perfect studio shot. Clearly it isn’t one (gotta love tripods, right!). I love it because this was such a fun day and the way the wind is blowing our hair around is so funny. It just says “good times” all over it to me. And THAT is what makes a family photo perfect!